Katadyn technology has created a new dual filter water filtration system. The Katadyn's proven 0.2 micron ceramic filter has been combined with an activated carbon filter creating a system that eliminates not only bacteria and microorganisms including Giardia and Cryptosporidium but also malodorous and noxious chemicals, chlorine and iodine. The COMBI Filter is a must piece of equipment for the world traveler and the serious backpacker. If the taste, odor or chemical contamination of the water is not a factor, the life of the carbon can be extended by removing the carbon cartridge from the upper chamber of the filter, prior to water treatment. it can easily be removed and replaced whenever necessary. With a capacity of over 13,000 gallons for the ceramic and 60 gallons of carbon filtration, it is truly remarkable. Size is 2.4" x 10.4", weight 22 ounces, warranty is one year. 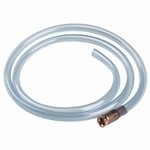 The Combi Plus has an add-on kit that includes: a base, hose and spigot to allow connection to a sink faucet for normal indoor-home use.